Father’s Day doesn’t get the same billing as mom but dad understands. Still, it is his day so you want to make sure he knows how special he is. Father’s Day gifts don’t get any better than “Pizza & Wings” – you’re talking dad’s language now – but especially when you tell him you sent Chocolate Pizza and Peanut Butter Wings! Bingo! Dad will appreciate whatever you send him for Father’s Day so why not skip the tie or sweater or hat and send him something he’ll actually remember. 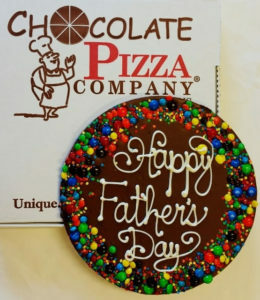 Featured on Food Network, Home & Family Hallmark Channel, Pickler & Ben, Forbes and more Chocolate Pizza Company has been keeping dads happy with good chocolate for nearly 30 years. 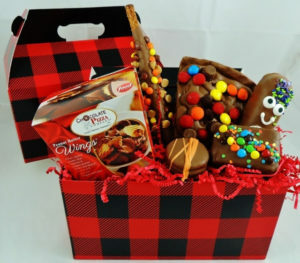 Mansket: Meet the Mansket – yes, the Mansket – its a “man’s basket” and it’s not like any gift idea you’ve ever seen. The Mansket is made for that cowboy-type man in your life who will definitely get a kick out of this surprise. The chocolate comes in a paper bag instead of a basket, added newspaper instead of tissue paper and finished with a nice piece of silver duct tape for a bow he’ll appreciate. The Mansket is as fun to give as it is to get. 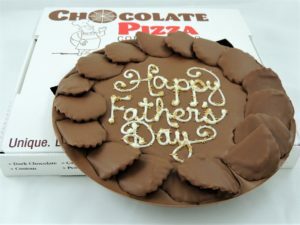 Father’s Day Chocolate Pizza: Surprise him with a unique and delicious gift that he can share with family and friends – something with our famous blend of rich milk or dark chocolate and homemade English toffee, topped with a festive border of chocolate candies and sugar confetti with “Happy Father’s Day” scripted in white chocolate.